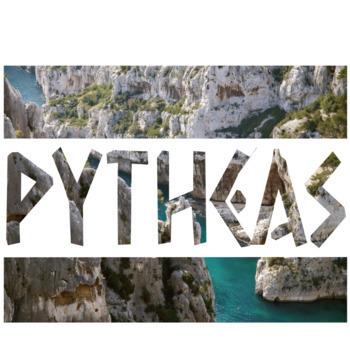 Pytheas was the first ever Ancient Greek to reach Britain around 300BC. In this short account of the journey from Marsaille to the real and imagined places he visited he encounters giants, an underground city, and the coast people of Great Britain. The story helps portray the convoluted task of putting together history, and accounting for the facts of the subjective unknown. What we mostly have to draw on are quotes from his text made by historians, since the Pytheas actual account was lost or destroyed. Herodotus claimed that Pytheas was a liar. Polybus, Strabo and others disputed the historicity of his account. This would work as an engagement tool before or after reading The Odyssey, Jason and the Argonauts, or another nautical Ancient Greek text. It would also work in a social studies classroom as a text to look at ancient explorers. 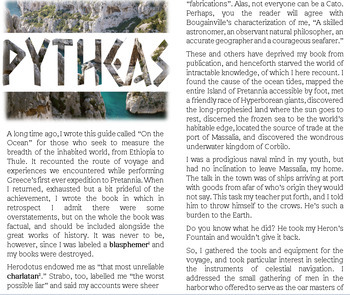 A long time ago, I wrote this guide called “On the Ocean” for those who seek to measure the breadth of the inhabited world, from Ethiopia to Thule. 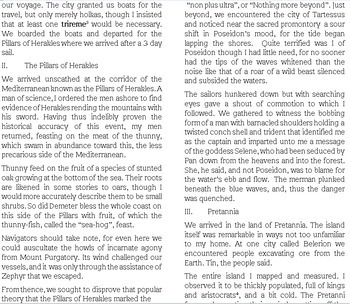 It recounted the route of voyage and experiences we encountered while performing Greece’s first ever expedition to Pretannia. When I returned, exhausted but a bit prideful of the achievement, I wrote the book in which in retrospect I admit there were some overstatements, but on the whole the book was factual, and should be included alongside the great works of history. It was never to be, however, since I was labeled a blasphemer and my books were destroyed. These and others have deprived my book from publication, and henceforth starved the world of intractable knowledge, of which I here recount. I found the cause of the ocean tides, mapped the entire Island of Pretannia accessible by foot, met a friendly race of Hyperborean giants, discovered the long-prophesied land where the sun goes to rest, discerned the frozen sea to be the world’s habitable edge, located the source of trade at the port of Massalia, and discovered the wondrous underwater kingdom of Corbilo. 1) Freeman, Charles. Egypt, Greece, and Rome: Civilizations of the Ancient Mediterranean. Oxford University Press, 1999. 3) “The Civilization of the Greeks.” Western Civilization, by Jackson J. Spielvogel, 6th ed., vol. 1, Wadsworth, 2002, pp. 51–83. I have a COMPLETE UNIT of Greek Mythology Stewing and this will be part of it. The whole unit will include 20 myths of about 9th grade reading level, at about 1500 to 6000 words each. It will include pre and post tests with freewriting topics, discussion topics, activities, and contextual content. It will focus on virtues, vices and heroes. Want to know more about me? Here's my blog.